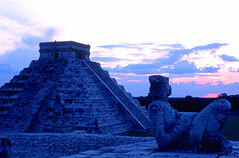 Mexico : June 27 - July 17 - wonderpaars jimdo page! I love Playa del Carmen. So the thought of starting our 10-month trip there was a dreamy inspiration for packing up life in San Francisco and starting life on the road. Our intention was to take a week of Spanish classes in preparation for South America and bask in the sun. Not much else. But alas, this was our first lesson in dealing with the unexpected and what happens when you cling to expectations that do not have the outcome you are so hoping for. We didn't plan on Patrick getting sick, we didn't plan for a Playa del Carmen that had grown exponentially since our last visit and was more touristy than we wanted and we didn't plan for Patrick's back-pack to get stolen. Now in hindsight, the psychological impact these unexpected inconveniences had on us could have been avoided, but that comes only after many lessons learned and living the life of a traveller. On the 3nd day in Mexico, Patrick got a terrible cough and cold that kept him in bed for the first week. Somehow we did manage to gather enough energy to visit Tulum - the magical Mayan ruins that sit high above the sea. The ruins, against the back-drop of the crystal blue water is really heavenly. On the 7th day in Mexico, waiting at the bus station for a bus to Merida, Patrick´s backpack was stolen from below his seat and between his legs. It included the computer, back-up harddrive, German passport and 2 credit cards..plus of course other stuff. Good news is that it was almost all covered by insurance, however that meant a load of paper work for us! We managed to get to Merida and arrive at the front door of my uncle's home. He opened the door and his out-stretched arms were like out of a dream. I can't remember much of what happened next, except that we ended up a divinely designed open air restaurant, sipping a chilled white and trying to find the humor of the last few days. It was the evening that I thought would turn everything around. The next day we lunched with my uncle and visited his restoration projects. On the 10th day in Mexico, we realized without Patrick´s German passport, that we would need to obtain a tourist visit for Brazil because US citizen´s can not travel without one. And it can only be applied for in the US, at an Embassy or Consul General. This meant we had to fly to Miami much earlier than planned. So we changed tickets, talked with travel agencies and dealt with the logistical mess. While Patrick was sorting out our flight plans, I was delaing with the logistical pain of insurance and medical claims. Merida is quite equipped to deal with any sort of technological need, but at the end of the day sending faxes, scanning receipts and mailing forms becomes more tedious than one might expect. By this time the last drop of power had left the battery of our camera with no means of replenishing it, since the charger was solen along with the back pack. So please excuse that the rest of the mexico section of our trip will lack the multimedial aspects of our story. On the 11th day in Mexico, we learned that our Around the Pacific Airline tickets needed to be printed and they could only be printed at an American Airlines office and we could not wait until arriving in Miami. That meant, we would need to rent a car, drive the 3 hours to Cancun and get it figured out. And so we drove. First to the AA office on hotel super highway in Cancun - but their printer was broken. So then, we drove to the airport. And what could have taken 10 minutes took nearly 40, because no one had any idea what these tickets were all about. But we left with a stack of printed paper tickets, that I would need to gard with my life for the next 10 months. 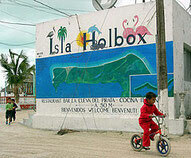 To make the trip to Cancun worth our while, we drove to a place called Holbox. The sun would be setting and we had no real sense of how far the trip to this island would be. 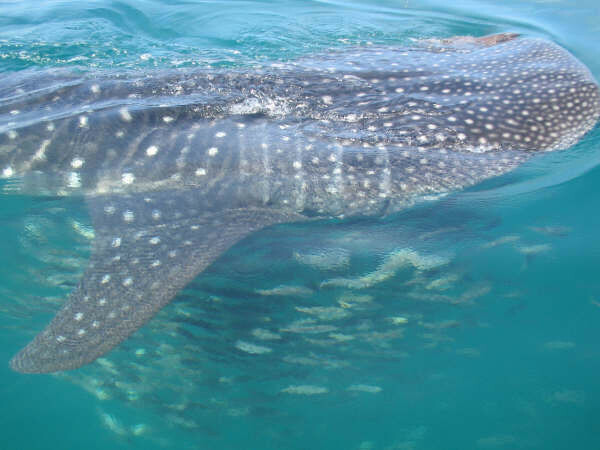 It is what lives in the sea around the island that makes this worth a visit - whalesharks devour plankton and gracefully flaot through the blue waters surrounding Holbox. And so we drove, through local villages and often asked at un-marked corners if we were still on the right path. The locals often laughed but nodded an affirmative. The paved roads became dirt and the sun was slowly beginning to set. How much further we thought. We had no room reserved, no sense of how one actually gets to the island. And then, ka*%#@! I was driving and I will admit I was driving perhaps just a little to fast, but the pothole also appeared out of no where. The large holes in the dirt road collided with our tire and instantaneously we heard the rushing sound of air. We were finished. Flat tire, busted rim. In the dusk of the evening, Patrick changed the tire (thank God we had one) as I listened to the sounds of the jungle coming awake around us. Ever changed a tire as the sun is setting on a desolute Mexican road, with the noises of unfamiliar critters getting louder and louder? Try it sometime. We finally arrived at what seemed to be the end of the world and found one place that looked like a hotel. The senora had a room for us, we paid, locked the car and sat down on the bed. It was a miserable room and we had no food. And nothing was open - there was actually nothing around that could have been open. We walked to the pier, found a few locals loading boats and with broken Spanish learned that we could take a boat to the island tonight. It was dark out there, as I looked into the distance, over the sea. Did I really want to get on boat, with no idea where I was going, and watch as we drifted in pitch blackness of the water? Um, no. But somehow, as we walked away, I realized this trip was going to be about pushing limits and breaking part my comfort zones. Yes, let's do it. We could only get back half of our money from the Senora, which we didn't argue with and parked our car in the lot behind her place. Moments later we were on board. Somehow the skipper called ahead for an open guesthouse and before we could really think about it, we were sitting in what you could call "stretch" golf cart that took us to the guesthouse. Soon latter we were drinking fresh banana shake in the middle of town. Holbox is dreamy - with sand streets and no cars. Golf carts serve as the mode of transportation and within minutes you can walk from your room to the beach to the zocalo (Square in the center of town) and back again. La balena's (whalehark) presence and influence on the local community is evident in murals and business names. It is everywhere. We could not wait for the next morning to see one for ourselves. As mentioned above, our camera was all out of juice - because the chargers had all disappeared along with the backpack, so we had to rely on Patrick's phone to document our time on Holbox. 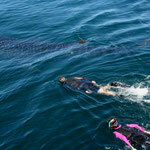 We arranged a boat and with Patrick at the bow, along with the local guide, we found a whaleshark fairly quickly. Patrick was in fact the first to spot it. They float at the surface while they eat, which makes them easy to see. There were strict rules about our behavoir and how we could interact with it - but those did not diminish the first sight of it. It took my breath away. It was incredible. Two people in the water at a time, I watched the first ones have their swim. 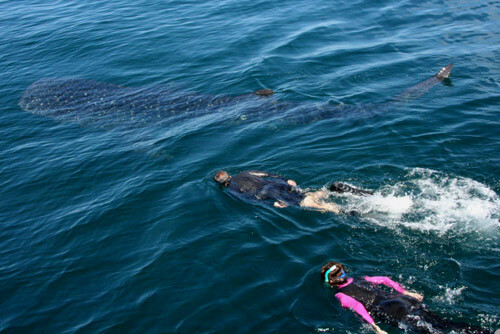 When it was my turn, without any fear, I was in the water and it was divine. 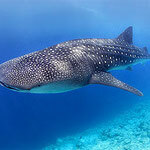 This beast is a sea buddha - peaceful and tranquil - as it glides effortlessly through the water. 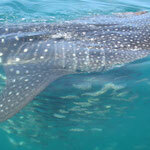 I think I could have stayed on Holbox for a while. But the spontaneity of our trip, including now having a rental car that needed to be returned, meant we would have to return to Merida. That also meant facing the music of the broken tire rim. 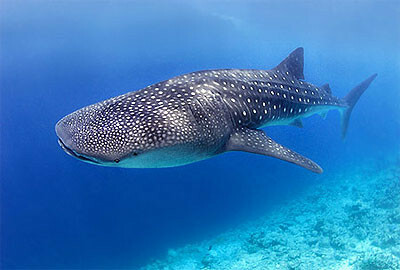 Holbox and the whaleshark had changed our mood and the romantic notion that we were now so free and ready to travel was with us. When we got to Avis and had to pay $150, the romance died. My uncles' guestroom was also now being used by other guests - so we caved and checked into the Hyatt Regency. Nothing like a fancy hotel room to heal the spirit. We were supposed to start Spanish language classes this morning. It didn't happen. We did move from the Hyatt to the Hotel del Peregrino, closer to the center of Merida. Patrick's cough was only sounding worse and perhaps we figured we could start with classes later in the week. Instead we entertained ourselves with a city tour aboard a double decker bus, always a good way to get a overview of a new place. I got to know the Internet cafe like a good friend. 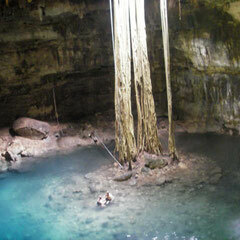 We did manage to explore the cenotes (deep underground pools) around Merida one day. The dusty trip to the area around the cenotes is full of local villages and life that is missed when you stay in tourist traps like Cancun. Signage was not clearly posted, so again we relied on the goodness of strangers to point us in the right direction. The bus dropped us in what seemed to be an abandoned town, but as the bus turned into the parking lot, immediately a gaggle of eager boys and a few older men arrived on bicycles, wanting our business. They would peddle us the few kilometers to the donkey express, that would take us the rest of the way. Yes, I said donkey express. The mode of transportation for cenote viewing (because there are so many in a small area) is these donkey carts that are running on a mini rail system in the ground. The rickety wooden carts run on the track, sometimes in paths as narrow as the cart itself. It was one of our first, "Where the hell I am moments?" Clearings in the dry bush appear and this means there is a cenote near by. They often require a steep descent down - usually on self built wooden ladders or steps. 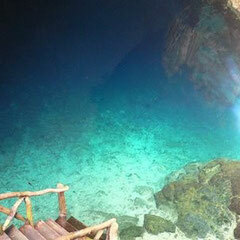 The water is crystal blue and with the dry heat outside, it doesn't take long to remove your shoes and jump in. 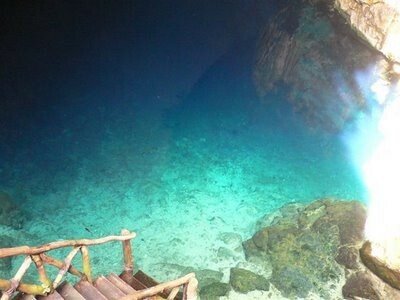 The eyeless black fish that is unique to the cenotes is visible when you look down into the water and just adds to the surrealness of this landscape. We spent the day being carted along by a donkey and swimming with blind fish. What a start to our adventure. On the 14th day in Mexico, Patrick woke up with a really high fever and the sound of his cough had only gotten worse. 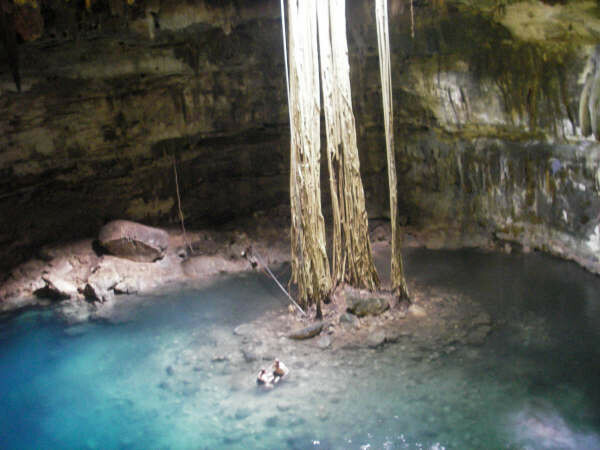 I assume jumping in and out of cold water in the cenotes was not the best choice. However, Merida is the "medical tourism" capital of Mexico, so we learned that we would be in good hands. Our hotel made an appointment with a doctor and moments later we were in a cab. We went to the doctor and after an x-ray discovered that he had a beginning case of pneumonia. Option: hospital or nice hotel with air conditioning. We chose the fancy hotel and were on our way with antibiotics! Fantastic doctor, in and out in 2 hours, with blood work and x-rays and only $150 total for everything! The bump on this trip is that Patrick´s phone fell out of his pocket in the cab...never to be seen again, including all the Holbox and cenote pictures. I thought it would be safer in his pocket than left in our hotel. Unnecessary loss, really. We returned to our hotel and I tried to make Patrick as comfortable as possible. Our fan only room had been a delight, as had the communal breakfast, but we needed to keep the temperature cooler. Usually we are anti air conditioning, but we needed a way to regulate his temperature. I found the Casa Lucia, a traditionally beautiful pension in the middle of Merida. It is on the street that on weekend evenings is closed to traffic - the restaurants then pull their tables to the street. Live music and dancing is the entertainment and the whole thing was the romantic essence that is Mexico. Sadly, Patrick was not in a condition to truly enjoy it. It was time to leave Mexico and hopefully some day look back and laugh. Luckily Patrick was feeling already a lot better. But before heading back to Cancun for our flight to Miami, we stopped in Chitzen Itza. There is a hotel resort that boarders the back entrance to the ruins. From the front steps, there is a piece of Mayan ruins visible on the horizon and the jungle that surrounds it is as equally part of the ruins as the hotel. It was a tranquil place to arrive at and a fantastic transition from the city like feel of Merida. We arrived in time to enjoy the evening light show and found a seat on the ground amongst the many visitors. Like so many other sites of historical value, they become overcrowded. In order to get a sense of the surreal tranquility of the place, we arrived the next morning at dawn, as the world was just waking up. There we explored the grounds all on our own. With no phone and no chargers for the camera, the images had to simply be a part of our memory. I have been to Miami, specifically Coral Gables to visit my childhood friend Elizabeth (whom you might remember from the wedding), so streets were indeed familiar. But it wasn't until we saw Elizabeth, that I really melted into the comfort of that familiarity. We spent the day playing in the sand and the pool - I am not sure if Olivia or Patrick had more fun. We learned how to drive a Hummer - well actually a only a golf cart gone hummer, but it looked quite real. Transportation throughout this resort was mostly by golf cart, that was not the surprise. It just happened to be that the home Elizabeth rented came with the golf cart of all golf carts - the Hummer edition. With his travel hat and Terminator sun glasses, Patrick was perfect match for the beast, and Olivia played right a long as the perfect passenger. The next day Elizabeth packed everyone up and headed back to Miami and she graciously offered Patrick and I to stay on for a night without her. We indulged ourselves in the beautiful home and prepared ourselves for the travelling life that was now just a day or two ahead of us. When we were ready to pack up and leave, we headed back to Miami as well, back to the Coral Gables Hotel and then found the time to squeeze in as much time as we could with Elizabeth. We had dinner with her mom and dad, we played with the girls and we left Miami with true feeling of belonging and gratitude for the close friends in our lives.